About the English Language Program through our partners at Middlebury Institute of International Studies, Monterey. Working with the Middlebury Institute of International Studies, Monterey (MIIS), the Partnership is also introducing an English language program in the primary grades 3-6, as well as a One Laptop Per Child program. The Partnership has long donated desktop and laptop computers to the school, but with students from MIIS as part of the team, the English and laptop programs will now have a formalized curriculum. Students from the EFL Haiti team (English as a Foreign Language-Haiti) plan to travel to St. André’s for the January 2014 term to begin their teacher training program. They are the pioneers of a new initiative at MIIS to develop an ongoing immersion program for interdisciplinary groups of students to continue teacher training and community development at St. André’s. 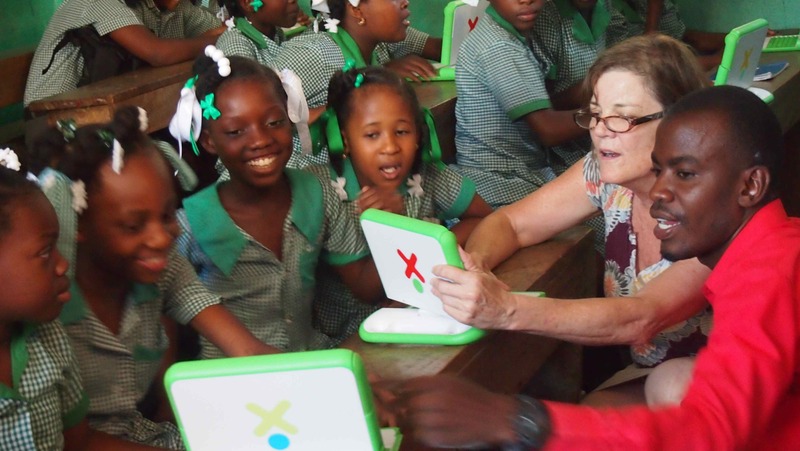 The OLPC laptop program in particular will be a most tangible and powerful change we can make at the school. The MIIS students are developing an English language/computer skills curriculum for 3rd-6th grades. With the Partnership donating more Windows and Linux laptops and supporting the creation of a new Resource Center/Computer Lab at the school, St. André’s students have the chance to develop language and computer skills that will make them more competitive in the extremely impoverished employment market in Haiti. As of Spring 2014 there have been three trips by MIIS EFL Teams to St. Andre’s in Hinche.